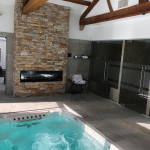 The Swim Spa Project Of The Year for 2018, Hydropool Manchester’s clients enjoy a healthy lifestyle but neither of them enjoy visiting health spas or gymnasiums so wanted an at home pool that would fit into the available space they had. 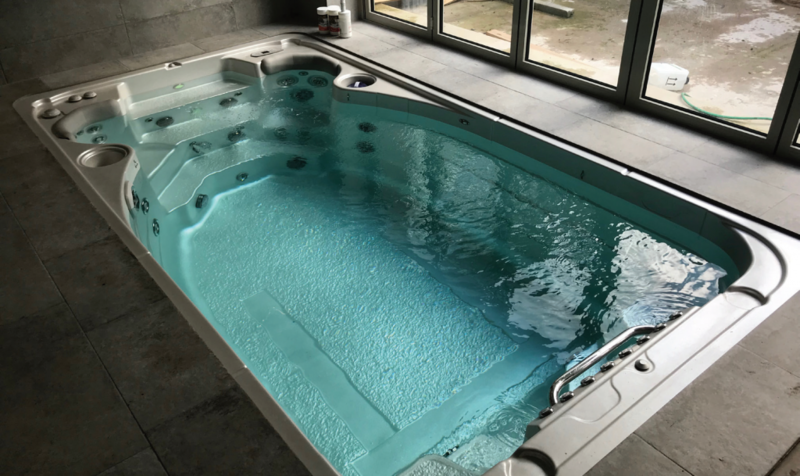 After seeing the Hydropool AquaTrainer in action at the Hydropool Manchester showroom, they were immediately impressed by the power of the swim current and also the adaptability of the integrated AquaPro Swim Control System. The Aquapro Control is situated on the wall of the swim tank and allows the swimmer to program in the duration and intensity of the swim current. They particularly liked that the control is within easy reach of the swimmer enabling them adjust the swim intensity through 10 levels, view distance covered and calories burnt during a timed swim. The most challenging aspect on this installation was the pit for the swim spa, as the site was in a high water table. However working closely with the main building contractor, and by attending site visits, at each stage of the excavation and pit construction, everything went very smoothly. Delivery was by crane from the main road and into the internal courtyard. The swim spa was manoeuvred into the building where the Hydropool Manchester team used two inflatable spa wedges to lower the swim spa into the preconstructed pit. 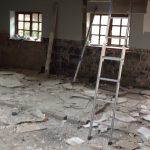 Filling and commissioning was undertaken at a later dateonce the pool house was completed and tiled. The swim spa was tiled over the lip which is unusual but the finished effect looks outstanding. The client feedback, in the recent UK Pool & Spa Awards, was that the Hydropool Manchester team were ‘amazing’ and provided all the relevant information they needed for what was a massive project for them. They told the contest judges that they visited a few other swim spa providers before visiting their showroom and were very impressed by their product knowledge, professionalism and willingness to listen to our requirements and needs. “We absolutely love the swim spa and use it regularly for swimming, cross training and rowing, as we had the optional rowing kit fitted which is great,” they said.